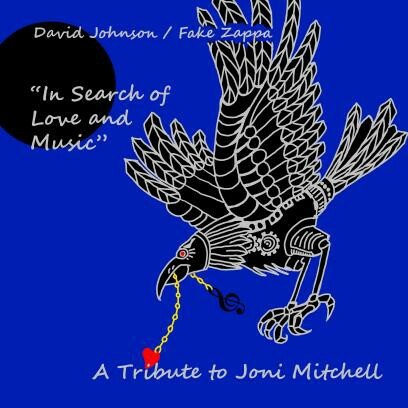 SEATTLE, WA & PORTLAND, OR JANUARY 2019 - Two artists from the Pacific Northwest have come together to collaborate on "In Search of Love and Music: A Tribute to Joni Mitchell". David Johnson and Jason Ingram (a.k.a. Fake Zappa) met in 2012 when Jason was visiting Washington from Portland, OR. They immediately connected over a shared passion for making music and art. David, a singer-songwriter with a flare for folk and pop, and Jason, a fellow singer-songwriter, artist, highly talented multi-instrumentalist and music teacher, combined their unique skills and perspectives on this project. Both of them share a deep love for the immensely influential nature of Joni's work, and it is that love that inspired the pursuit of the tribute. The songs were recorded both in Portland, OR and Sultan, WA. The selections come from Clouds, Blue, Court and Spark, and Hejira. Jason utilized his digital programming prowess to bring fresh, new approaches to several of the songs, intending to bring Joni's music to younger listeners that may not be familiar with her work. The album begins with a bubbly, electronic take on the upbeat "Carey", followed by a stark and provocative trap and hip-hop inspired version of "Black Crow", from which the album title came. Also offering more traditional takes on the material such as "Roses Blue," "Car on a Hill", "Furry Sings The Blues" and "The Last Time I Saw Richard", David and Jason send a nod to the songs that have impacted them most. The album concludes with an a capella version of "River" sung over the sounds of city traffic, recreating the environment which Joni was seemingly seeking to escape in the original song. There are a couple noteworthy aspects of this endeavor. Both artists deal with mental illness and are able to cope and heal through making and playing music. They supported each other carefully through the process of creating the album and continue to do so through continued communication. Both artists are also gay, which when considered in regard to some of the selections, brings a particularly idiosyncratic and gender-bending twist to the stories within the songs themselves. The album is available for purchase digitally on iTunes. This article has been viewed 550 times since being added on January 25, 2019.